It’s been two years since the last major update to iTunes, with changes I called “the most radical alterations to the program’s interface since its inception.” I could use those same words to describe iTunes 12, which features yet another interface overhaul. But the other shock is that iTunes 12 is light on new features, just a Recently Added section in some views, and a new Get Info window, along with some minor changes to device syncing. It almost begs the question: Without new features, is it really necessary to alter the look and navigation of iTunes every couple of years? iTunes 12 feels like essentially the same app as iTunes 11, only less intuitive. In order to explain where the new Recently Added section shows up, I need to describe the sometimes confusing navigation options in iTunes 12. Basically, it takes three separate sets of controls to navigate around and sort your media the way you want. First, a set of buttons at the top-left of the window lets you switch libraries: Music, Movies, TV Shows, Podcasts, and so on. You can choose which buttons appear here by clicking the More menu (it looks like an ellipsis) and choosing Edit. Choose which media libraries you want to access via the navigation buttons. It’s fine to remove buttons you don’t use a lot, since you’ll still be able to access the other libraries from the View menu, or use keyboard shortcuts. (Command–1 goes to the Music library, Command–2 to movies, and so on—check the View menu to see all the shortcuts.) 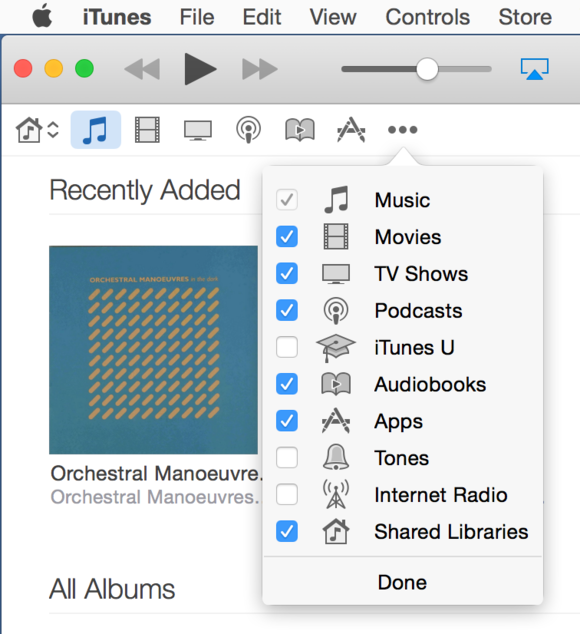 With Home Sharing turned on, you can access other iTunes libraries on your network with the house button on the far left, which glows blue when you’re looking at a shared library. Once you’re in a media library, there’s a second set of tab-like controls in the center of the window. The Music library, for example, has My Music, Playlists, Radio, and iTunes Store, as well as Match if you subscribe to iTunes Match. Use these buttons to navigate within a media library, or to switch to the iTunes Store. The third set of controls is the View Options menu at the far right of the window (also accessible by pressing Command-J or selecting View > View Options). The options here are only slightly different than in iTunes 11. Within Music, for example, you can view your library by Songs, Artists, Albums, Genres, and Composers. Movies and TV Shows offer a default view with artwork, a list view, and a view by genre. Audiobooks let you view by title or author, but not by genre. 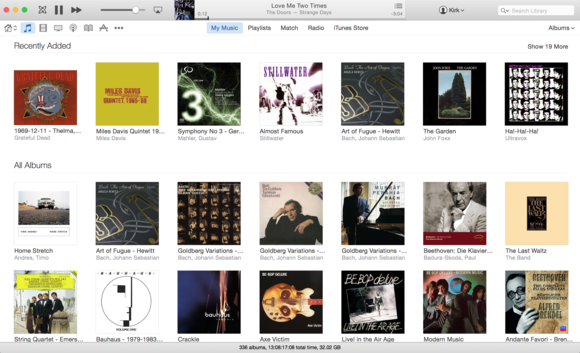 If you like the list view, you can even approximate a pre-iTunes 11 display. In your Music library, choose the Songs view and then click Playlists—that playlists sidebar should look familiar. You can still use the Column Browser (Command-B) in some views as well, including this one. The View Options menu also lets you choose which columns to display in list views, how to sort items within the list (by album, artist, or genre, for example), and whether you want artwork, and how big. Overall, I find the navigation confusing—it requires too many clicks to get around. While iTunes does remember your selections for each library, once you start changing views and sections, there’s too much thinking required to get to your destination. The new Recently Added section shows up in different views and locations. For example, in your TV library, Recently Added is near the top of the TV Shows view. In your Podcasts library, if you click My Podcasts and view by Podcasts, you’ll see Recent Updates in a sidebar, with episodes denoted by age in the main window. But Recently Added section is inconsistent. I can see it in my Music library and in Albums or Artists view, but not when viewing by Composer, Genre, or Songs. It doesn’t show up in list views in Movies and TV Shows, or anywhere in the libraries for Audiobooks, Apps, Tones, iTunes U, and Internet Radio. You can view the Recently Added “shelf” in a number of views, and see which content you’ve added in the past day, week, recent months, or the past year. It’s a handy feature, but I’d like to see a more general Recently Added section with all my content, not filtered by type. I’d also love a timeline, like in Time Machine, so I could click a given month and go back and see what I added to my library then. Since each content library has its own iTunes Store tab, they go to the sections of the store that sell that kind of content. Clicking iTunes Store when you’re in your Music library takes you to the Music storefront. But this means there’s no longer a home page for the iTunes Store. You no longer have the chance to see a banner for a new movie, a best-selling book, and a hot album on the same page. The iTunes Store is divided into sections with no home page, and your account info is in a dropdown in the toolbar. This means it always takes two clicks to leave the store and go to a different local media library. Remembering this keyboard shortcut will help: If you’re anywhere in iTunes and want to get to the currently playing item, just press Command-L. Since there’s no iTunes Store home page, a dropdown menu toward the top-right of the window, labeled with your name, has links for your Account, Purchased content, Wish List and more. The Wish List is no longer accessible directly from your iTunes library—it’s a page in the iTunes Store, and you can only see one type of content at a time, not your entire Wish List at once. 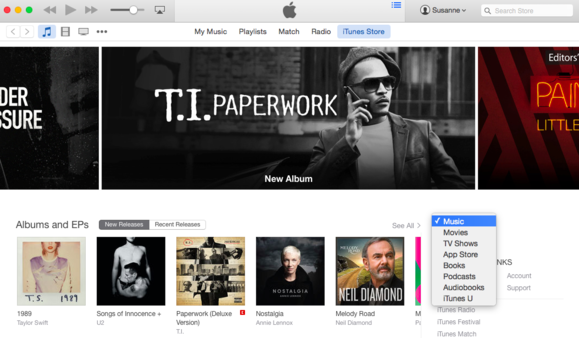 The new Info window is a big change from previous versions of iTunes. I find the lack of borders around the text fields make it a lot harder to visually scan the window, like trying to use a spreadsheet with no borders. It’s also hard to tell which fields are editable. I’m also disappointed that not all available fields appear by default. To add extra fields you have to click Add Field at the bottom. On the plus side, Apple finally provided a clear explanation for what a Compilation is. The auto-complete feature in the Info window is improved. When you start typing in a field, previous versions of iTunes would auto-complete the field to the first similar name in alphabetical order. But that meant when I’d start typing Bach, the default autocomplete is the alphabetically first “Back, Carl Philip Emmanuel” instead of the more popular J.S. Now, iTunes displays an auto-complete list, and you can use the arrow keys to choose a name. When you connect an iPhone, iPod, or iPad, an icon to the right of the media library icons lets you access its sync settings, which appear in a sidebar instead of tabs across the top. If you have multiple devices, you can switch by clicking a device’s name in the center of the toolbar, or use the popup menu to the right of the media icons, which shows each device’s name, plus its capacity and charge level. 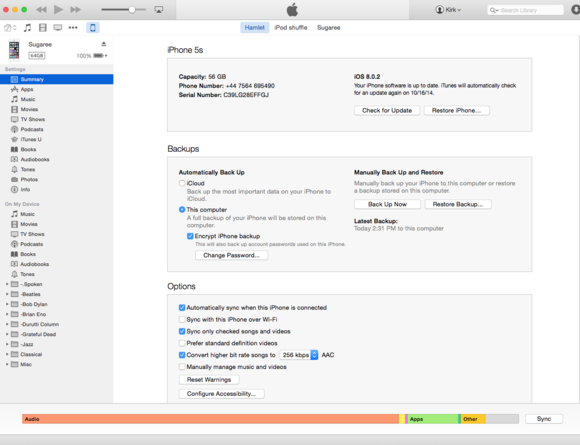 iTunes 12 has rethought the way you view your content when syncing an iOS device. Having, for the most part, abandoned the sidebar in iTunes, it’s surprising to see Apple bring it back for syncing. But I find it much easier to understand. With the sidebar exposed, select a media kind under On My Device, and you’ll see an Add To button in the top-right corner. Click it and you can select media, drag it into a sidebar that appears on the right, and click Done. This sort of syncing seems to occur more quickly than a full sync, especially for small additions like a new album or movie. Along with the navigation changes, iTunes 12 has a new red icon, the same color as the Music app in iOS. I like it—the red icon stands out better in the Dock and the Command-Tab application switcher. iTunes 12 is flat—gone are the drop shadows and relief that made iTunes 11 look slightly three-dimensional. Now Yosemite-style flat design is everywhere, from the album art and app icons to the navigation buttons. It doesn’t particularly add or detract from iTunes—as with the rest of Yosemite, you’ll like the flatness or you won’t. iTunes 12 will certainly be controversial, just as iTunes 11 was. Some of the interface changes are confusing and add a new layer of abstraction to navigating multiple types of media. If you routinely stick with just your music library, it’s pretty easy, but if you have a fully stocked iTunes library, be prepared to click a lot more to find what you want. I’m not on the “split iTunes because it’s bloated” bandwagon. It makes more sense to have one app manage all my media. But I think these changes—particularly the tighter integration of the iTunes Store—will incite more people to campaign for the dismemberment of iTunes. And it’s not all bad. 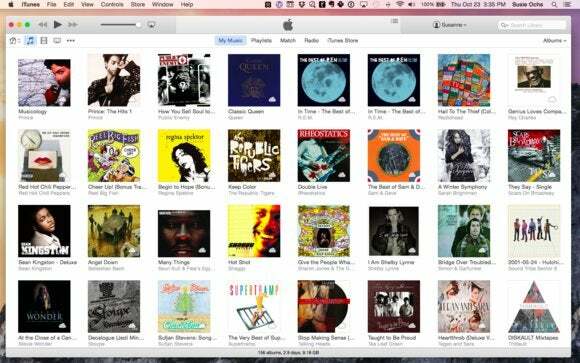 iTunes 12 feels more coherent than iTunes 11, and it fits better with Apple’s aesthetic. It no longer feels like the poor cousin compared to OS X, and that may be a good thing—or it will be a good thing when more order is brought to it. 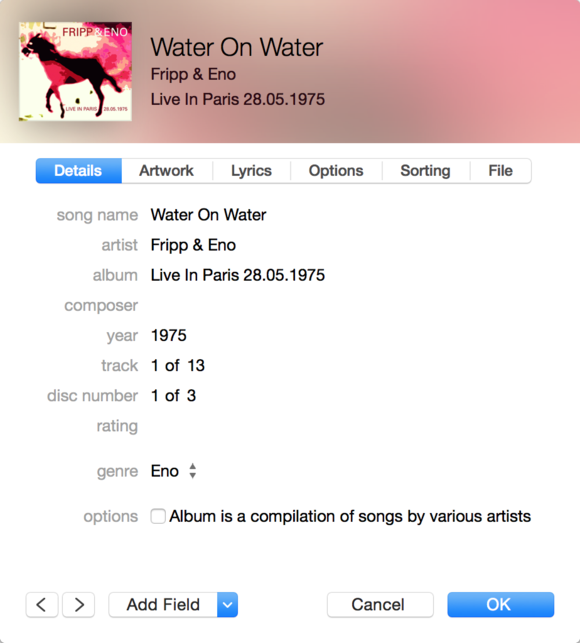 But for now, iTunes 12’s most basic operation—finding and playing media—requires a lot more thought than it should.